The sprawling 12th-floor pool terrace is prime for an escape, with its sweeping views that stretch over the Biscayne Bay and the Miami skyline. 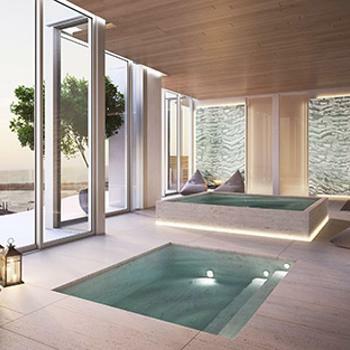 Residents can enjoy a dip in the zero-entry pool and a soak in the infinity-edge Jacuzzi before retreating to recline in the spacious private cabanas, outfitted with plush chaise lounges. 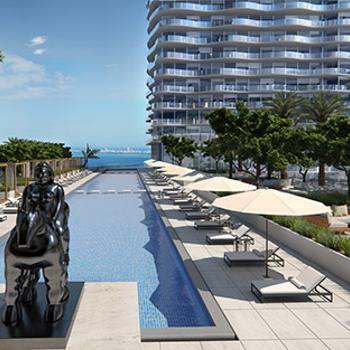 Contemporary tropical landscaping and Zen Garden, designed by Enzo Enea, elevate the experience into one that reflects the distinct luxury of Miami. Whether entertaining or simply enjoying a day of hard-earned relaxation, residents can also make use of the summer kitchen grilling area and umbrella-shaded dining tables on the terrace. When the sun goes down, the lounge area’s fire pits promise to heat things back up. And no matter the occasion, the pool cafe – featuring selections from Auberge’s on-site restaurant – is ready with premium food and beverage options. 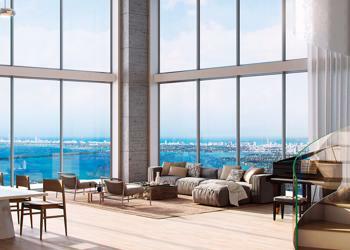 Members of the Auberge residences enjoy access to a slew of carefully designed amenities and social spaces. The facilities include a fully equipped fitness center, complete with views of Biscayne Bay, as well as an innovative golf simulation room. Auberge’s signature spa allows you to unwind as you pamper your body and mind, with a decadent roster of massage and beauty treatments, as well as steam and sauna facilities. A generous party room can be tailored for any festivities, while spaces such as the children’s playroom, video game room, screening center, and library are always ready for action. The wine room and cigar lounge make for elegant escapes, and the high-end gourmet shop and 24-hour convenience store make life even easier with integrated key-fob payment technology. Auberge’s planned world-class restaurant guarantees sophisticated dining mere steps from your front door. 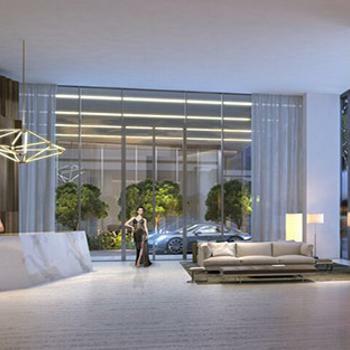 Nothing defines true luxury better than peace of mind, and that is what Auberge Miami seeks to deliver to every resident. The attentive concierge and service staff are available to handle any and every need that might arise, day or night (see next page for details). The complimentary valet service operates 24 hours a day, while self-parking remains an option for those who prefer to do so. All vehicles are housed in a secure garage on the premises. Attended security services and controlled building access make it so residents can let down their guard. In addition, we offer air-conditioned storage spaces for residents’ use. Auberge Miami is a full-service destination that makes coming home a delight, each and every time. The optimistic blues of the afternoon, the soothing pinks and purples of sunset, or the mysterious darks of the night – no matter the time, the sky is the limit when it comes to the observatory at Auberge Miami. Soaring to a dramatic 650 feet in the air, the private observatory is the highest in the city of Miami and features stunning, unparalleled panoramic views. 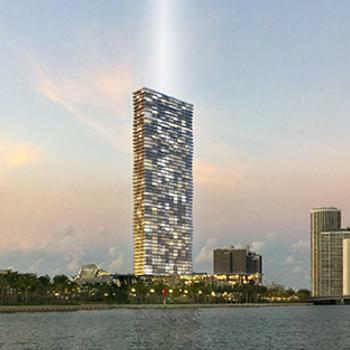 With an outpost like this, it would be difficult to forget what makes Miami living so distinctive. 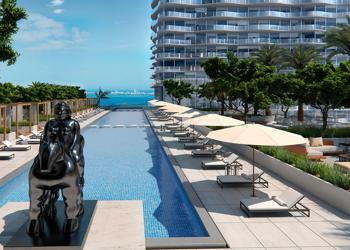 The generous sundeck also offers another pool, perfect for hitting the water and enjoying the tropical Miami weather. Afterward, it might be time to curl up with a good book, catch a hard-earned afternoon nap, or kick back for some chit-chat, and the gracious accommodations of the sundeck private cabanas present the perfect backdrop for a comfy retreat. There’s no end to the havens that await at Auberge Miami.